Miso soup is made by boiling soup ingredients in dashi stock and then dissolving miso paste in the hot broth. Ingredients of miso soup include daikon (giant radish) and other root vegetables, various kinds of greens, wakame and other varieties of seaweed, tofu and bean curd-related products, shellfish, etc. Miso is made by mixing steamed soybeans with koji (糀 こうじ salt and a fermenting agent) made of rice (kome 米 こめ), wheat, or soybeans; together with shoyu (醤油 しょうゆ), it is one of the basic flavorings of Japanese cuisine. Miso is a good source of protein, especially the amino acids lysine and threonine, but it also contains a large amount of salt, as much as 8 to 15 percent. Introduced from China in the seventh century, it became popular during the Muromachi (室町 むろまち) period (1333-1568). 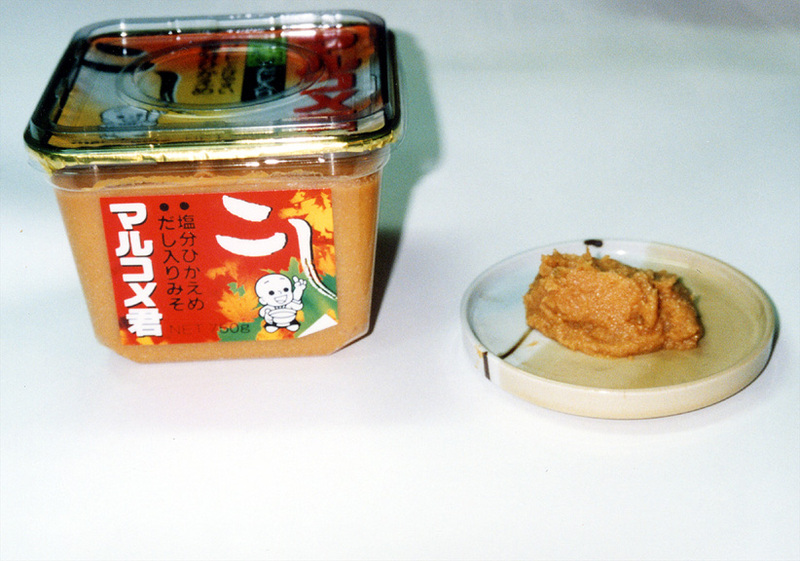 The color, aroma, and taste of miso differ according to the combination of ingredients, which vary from place to place.